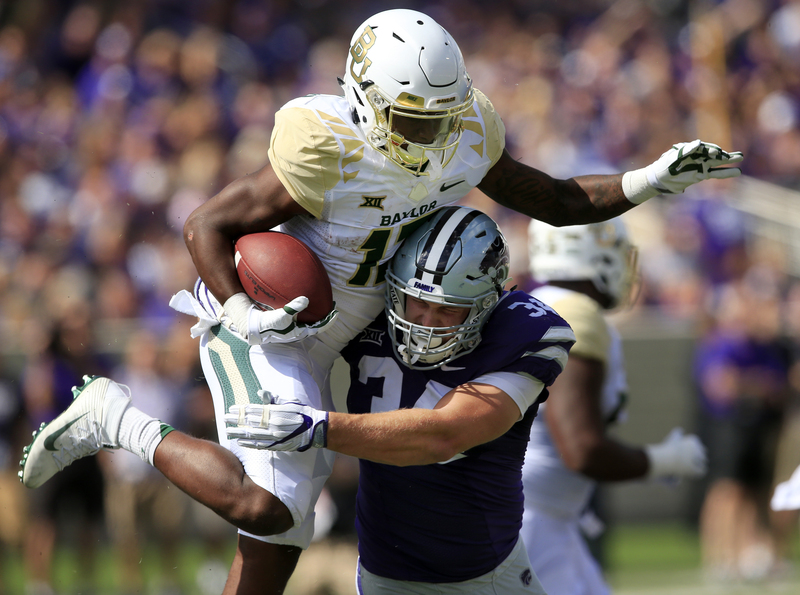 It looked like Kansas State was headed for a blowout in Saturday’s Big 12 opener against Baylor, but a lackluster second half left Wildcat fans mixed on the victory as a whole. Let’s break down both sides. 1. The D-Line has improved a lot from Week 1. A well-deserved tip of the cap to K-State’s defensive tackles and defensive ends in this game, particularly Will Geary and Tanner Wood. A couple weeks ago, pass rush was a concern for this team, but getting 3 sacks and making Baylor quarterback Zach Smith’s life difficult showed big strides have been made. If Reggie Walker can get going, the Wildcat defense will truly cement itself as one of the Big 12’s best. 2. Matt McCrane didn’t let the Vanderbilt miss get to him. There’s no better way to put a costly miss behind you as a kicker than going 4-for-4 your next time out. McCrane was critical to K-State holding on down the stretch Saturday. As long as the offense is sputtering, he’s going to be even more important than usual, and he looks up to the task. 3. The defense passed its first test against a competent spread offense. Holding Vanderbilt to 14 points is one thing. Limiting Baylor, who torched Oklahoma a week ago, to 20 points is even better. Yes, there were a couple broken plays in the second half, but I thought a big factor in those was not having starting nickel back Cre Moore on the field. Tougher tests lie ahead, but the early returns on Tom Hayes’ group are good. 1. The drops haven’t stopped. Many hoped a week off would benefit K-State’s receivers, who had too many dropped passes in the loss to Vanderbilt. Unfortunately, the issue only grew Saturday, with at least a score or two being wiped out as a result. This is officially something to feel nervous about. What makes it more frustrating is that Byron Pringle and the rest of the group have been very good at running routes and creating separation from their defenders. They need to do a better job of cashing in on it. 2. Still no mojo for the running backs. While Alex Barnes and Justin Silmon have shown their capability to break out big runs of 20+ yards, the frequency with which they’re held to short gains is a little troubling. Against Baylor, 50 percent of rush attempts by K-State running backs went for 3 yards or fewer. To put it another way: There is going to be trouble if Jesse Ertz is asked to be the Wildcats’ leading rusher in every game this season. 3. The Big 12’s middle tier is better than expected. Matchups with Oklahoma and Oklahoma State were enough for K-State to worry about, but the Big 12’s depth this season may be an even bigger issue. TCU, West Virginia and Texas Tech all look better than predicted. The Wildcats may even be an underdog next week at Texas. Getting through the league season with fewer than 2 or 3 losses isn’t impossible, but it’s going to require K-State to improve a lot from what we’ve seen thus far.